Years ago we only thought of one type of fencing and that was wood fencing. In todays market we have several options available to us. Fencing comes in wood, vinyl, aluminum, & metal. It comes in all kinds of shapes and sizes. 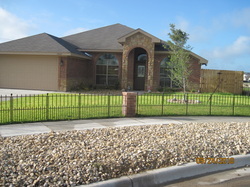 Fences can be used for decoration, privacy, and to determine ones property line. Anytime you add a fence to your property you have added value to you property. We, at Tutson's are the professionals to install you fencing and offer free estimates. Below are some images of fencing we have installed in the area.